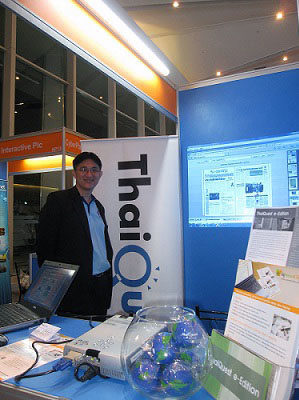 ThaiQuest Limited, the pioneer in Thai Search Engine, accompanied its e-clipping software renowned as “iQNewsClip” and prototype technology of virtual newspaper reading via web browser called “ThaiQuest e-Edition” in an innovation showcase exhibition zone held at ComWorld Thailand 2010, Royal Paragon Hall, 5th Floor of Siam Paragon Shopping Complex during September 30-October 3, 2010. The core strength of the two technologies lies in its fast and precise search for any Thai keyword in any page of the newspaper. Sarana Tasanasant, Senior Manager in Business Development of ThaiQuest Limited, stated, “This is the very first year for ComWorld event to arrange Appication World Zone for event attendees to experience the capability of Thai software and intriguing innovation. Many Thai corporates demonstrates with actual system to make it easier for event participants to understand how the application works. ThaiQuest brought along iQNewsClip software and ThaiQuest e-Edition prototype technology and demonstrates its competency in cost reduction for corporates with need to track the world’s movement from various newspaper sources or prepare daily news briefs for executives. The quality of both software is guaranteed by its recent winning of Thailand ICT Awards 2010 (TICTA 2010). iQNewsClip software is an innovative dimension of news clipping. Skillfully cropped news articles from Thai and English newspaper can easily be accessed online, available in black&white, color or text only in a clean and clear format. Together with Full-Text Search function, each clip is indexed and categorized to accommodate customer’s specific requirements. ThaiQuest e-Edition, on the other hand, is the prototype technology of online virtual newspaper reading with extensive touch-screen device support, crystal clear resolution across all zoom levels. Empowered by ThaiQuest Enterprise Search engine, user can quickly search for any keyword from any page of the newspaper. For more information about efficient search, please contact Business Development department, ThaiQuest Limited or visit our booth no. AP8 at ComWorld Thailand 2010, Royal Paragon Hall, 5th Floor of Siam Paragon any day during September 30-October 3, 2010.